A Comprehensive View of Autism Past and PresentThe must-read summary of "NeuroTribes: The Legacy of Autism and the Future of Neurodiversity" by Steve Silberman.In NeuroTribes, the ward-winning science journalist Steve Silberman changes the societal conversation about autism with a groundbreaking and comprehensive history of this much-talked-about but little-understood condition. The book reveals a perfect storm that led to the sudden increase in diagnosis beginning in the 1990s. It describes how parents were bombarded with conflicting and misleading information on the causes and potential cures of the disease. It also describes how to embrace the concept of neurodiversity to build a better world for autistic people rather than searching for potential causes and risk factors.This guide includes:	Book Summary—The summary helps you understand the key ideas and recommendations. Online Videos—On-demand replay of public lectures, and seminars on the topics covered in the chapter.Value-added of this guide:	Save time	Understand key concepts quickly	Expand your knowledgeRead this summary and learn more about autism from multiple perspectives—parents, scientists, activists, and the autistic people themselves. 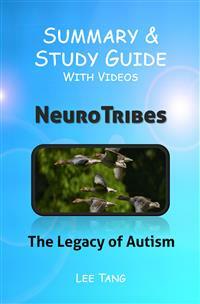 "NeuroTribes: The Legacy of Autism and the Future of Neurodiversity" by Steve Silberman. In this book, the award-winning science journalist Steve Silberman changes the societal conversation about autism with a groundbreaking and comprehensive history of this much-talked-about but little-understood condition. The book reveals a perfect storm that led to the sudden increase in diagnosis beginning in the 1990s. It describes how parents were bombarded with conflicting and misleading information on the causes and potential cures of the disease. It also describes how to embrace the concept of neurodiversity to build a better world for autistic people rather than searching for potential causes and risk factors. Steve Silberman is an American writer based in San Francisco, California. He is best known as a writer for Wired magazine and was awarded the AAAS "Kavli Science Journalism Award for Magazine Writing" in 2010. His Wired article "The Geek Syndrome", which focused on autism in Silicon Valley, has been referenced by many sources and has been described as a culturally significant article for the autism community. In May 2000, Steve Silberman, a science Journalist and author of the book "NeuroTribes: The Legacy of Autism and the Future of Neurodiversity," attended a "Geek Cruise"—a technology conference on board the ocean liner Volendam. He discovered the fellow passengers were not just a group of IT experts, but a tribe of digital natives who invented the modern digital world. Several also had children with autism, a rare neurological disorder as portrayed by Dustin Hoffman in the movie Rain Man. He soon learned there was an epidemic of autism in the Silicon Valley. THE AUTISM DISORDER was first discovered in 1943 by a child psychiatrist named Leo Kanner in Baltimore. Kanner noticed that eleven of his patients seemed to inhabit private worlds, ignoring the surrounding people. He named it autism - from the Greek word "autos", which means "self". It describes the conditions in which a person becomes an "isolated self." Autism was also independently discovered a Viennese pediatrician named Hans Asperger. In 1944, Asperger described four young patients who seemed strangely out of touch with other people. He used the term "autistic psychopathy" to describe their conditions. Unlike Kanner's patients, these patients spoke eloquently and displayed precocious abilities with science and math. Asperger called them his "little professors." FOR DECADES, ESTIMATES of the prevalence of autism had been around four or five kids in ten thousand. But that number had increased since the 1980s, especially in high-tech hot spots like Silicon Valley. One possible explanation for the surge of autism in tech-centric communities was that people with similar genetic traits attracted each other. In 1997, Simon Baron-Cohen, a cognitive psychologist, found that the father and grandfathers of autistic kids were more likely to be engineers. Could the marriage between men and women carrying the genes for autism cause the rise? Silberman explored that idea in his article titles: "The Geek Syndrome" in the December 2001 issue of Wired. The current estimate by the Centers for Diseases Control is that one in 68 school-age children in America is autistic. This book provides the history surrounding the changes in autism diagnosis, revealing a perfect storm that led to the sudden increase in diagnosis beginning in the 1990s. Most researchers now believe autism is not a single, but a cluster of conditions which manifest in different ways at various stages of a person's development. This book describes how parents were bombarded with conflicting and misleading information on the causes and potential cures of the disease. One promising development since the publication of "The Geek Syndrome" was the emergence of the concept of neurodiversity. Neurodiversity is an idea that conditions like autism, dyslexia, and ADHD are naturally occurring cognitive variations rather than dysfunctions in the population. The book encourages the society to embrace the concept of neurodiversity to build a better world for autistic people rather than searching for potential causes and risk factors. Autism refers to a broad range of conditions characterized by challenges with social skills, verbal and non-verbal communication, and restricted and repetitive behaviors. It is not a distinctive problem of modern times. Two remarkable scientists, Henry Cavendish and Paul Dirac, who had never lived the modern world, were believed to be autistic. In 2001, renowned neurologist Oliver Sacks suggested that Henry Cavendish, an accomplished scientist in the 18th century, could have Asperger syndrome, an autism disorder. Henry Cavendish was an English scientist who lived an eccentric live in a house on Clapham Common. He was famous for great accuracy and precision in researches into the atmospheric air, the law governing electrical attraction and repulsion, and calculations of the density of the Earth. Cavendish was a shy man, always dressed in an old-fashioned suit. He conversed little and developed no known deep personal attachments outside his family. Graham Farmelo came to similar conclusions for Paul Dirac when he researched for his book, "The Strangest Man: The Hidden Life of Paul Dirac, Quantum Genius." Dirac was an English theoretical physicist who shared the 1933 Nobel Prize in Physics with Erwin Schrödinger. Leo Rosa is the boy who loves green straws. Leo was diagnosed as autistic in 2002 when he was two years old. His father, Craig, produces science videos for a TV station in San Francisco, and his mother, Shannon, is a blogger, and software consultant. He has two sisters, Zelly and Gisela. For the first few months after he was born, Leo seemed like a normally developing baby. Not until his first birthday did his parents noticed anything unusual about him—he was taking his favorite toys and sliding them from one place to another, repeatedly.